The El Reg Special Projects Bureau (SPB) is pleased to announce we've finally come up with what we reckon is a worthy successor to our Paper Aircraft Released Into Space (PARIS) project. 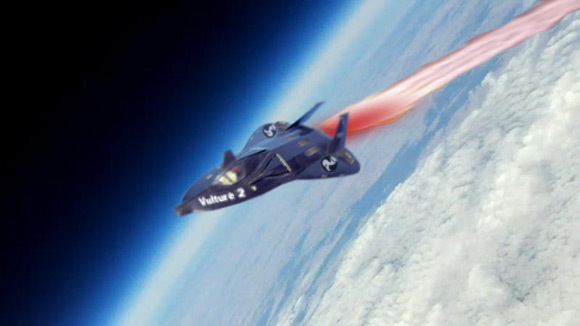 After a good deal of mulling as to how we could use our PARIS experience to launch an even more improbable and audacious plan to keep the UK at the forefront of space technology, we've decided that a rocket-powered aircraft is the way to go. Rest assured, though, that this is no common-or-garden rocket plane plan. Our aim is to launch the advanced vehicle from a helium balloon at maximum altitude, and then ask it to guide itself back to Earth via GPS and autopilot. A couple of our beloved readers had already suggested a similar aircraft concept after the Vulture 1 triumph, and once we'd coupled that idea to a possible "rockoon" launch, the image of the "Vulture 2" streaking across the stratosphere before gliding autonomously back to base proved pretty well irresistable. Design and test a lightweight composite material aircraft. The vehicle will have traditional control systems (rudder, ailerons, etc), controlled by an autopilot which operates on GPS to fly the machine back to base. Incorporate back-up tracking system, as successfully used on the Vulture 1. Pack in a couple of video cameras. Recruit Playmobil pilot, or Playmonaut, as they're known. Test aircraft and systems in low-altitude flight. Put together a main payload, as per PARIS, incorporating cameras and rocket plane release mechanism. Stick the whole thing under a big helium balloon, let it go, and wait for the fireworks. Easy as that - sort of. Obviously, the proposed Vulture 2 is a considerably more complex beast than its predecessor, with the rocket motor, electronic systems and control surfaces presenting new challenges to the SPB team. At the moment, this project (provisionally codenamed "LOHAN"), is simply our proposal. As ever, we'd love to hear your thoughts, suggestions and constructive criticism, which you can throw over via the comments on this story or to me, right here.